7/3/2012 – SOUTHWEST ASIA (AFNS) — Walking into the office of Lt. Col. (Dr.) Joseph Keenan, one could possibly imagine him in private practice in his home town — the warm, caring doctor the community has known for many years. But his Air Force “community” has only known him for two years. Keenan, who has been an ear, nose and throat doctor for more than 30 years, will celebrate his third anniversary of becoming an Air National Guard member in October. It will also be his 64th birthday. As he got older, the more he realized how fortunate he was to be born in America, said Keenan, who is a flight doctor assigned to the 131st Fighter Squadron in his home town of Westfield, Mass. He initially was unsure of his ability to achieve that desire, knowing there were age restrictions to joining the military. He said he came to realize that he could receive an age waiver and decided to try to join. His first application was unsuccessful. The process took about a year and included many steps, the final being with the secretary of the Air Force, Keenan said. He was finally sworn in on his 61st birthday. “It was really quite a time for celebration, one of the best birthday presents I could have received,” he said. Not only has the doctor gained new patients at his Guard unit, he was sent far from home to treat others. Keenan is currently assigned to the 380th Expeditionary Medical Group on his first deployment. Though he said the majority of his patients here are young and healthy and are seen for urgent care matters, he has had a few opportunities to assist with patients during temporary duty in Afghanistan. Keenan said he has been very happy with his life as a guardsman. Lt. Col. Christopher Borchardt, the 380th EMDG deputy commander, said he most appreciates Keenan’s attitude. 7/3/2012 – CHARLOTTE, N.C. (AFNS) — Four Airmen died and two others were seriously injured when a Modular Airborne Fire Fighting System-equipped C-130 Hercules crashed July 1 while fighting a woodland fire in southwestern South Dakota. Dead are Lt. Col. Paul K. Mikeal, 42, of Mooresville, N.C.; Maj. Joseph M. McCormick, 36, of Belmont, N.C.; Maj. Ryan S. David, 35, of Boone, N.C.; and Senior Master Sgt. Robert S. Cannon, 50, of Charlotte. The crew part of the 145th Airlift Wing with the North Carolina Air National Guard here. McCormick was an instructor pilot and chief of training for the 156th AS. He was married with four children. David was an experienced navigator and was also assigned to the 156th AS. He joined the North Carolina Air National Guard in 2011 after prior service in the active-duty Air Force. He is survived by his wife and one child. Cannon had more than 29 years with the Charlotte unit and was a flight engineer with the 145th Operations Support Flight. He was married with two children. The names of the injured will not be released. Both of the injured Airmen remain hospitalized. The crew and its aircraft, along with two other 145th AS C-130s and three dozen Airmen, flew from Charlotte to Peterson Air Force Base in Colorado Springs, Colo., June 30 to assist with fighting forest fires in the Rocky Mountain region. They were due to move to a base in Cheyenne, Wyo., July 2. The crash occurred around 6:30 p.m. Mountain time near Edgemont, S.D., as the crew assisted with battling what is being called the White Draw fire. The cause of the crash is unknown and is under investigation. North Carolina Gov. Bev Perdue declared that flags will be flown at half staff July 3 and President Obama expressed condolences honoring the dead Airmen. MAFFS is a self-contained aerial firefighting system owned by the U.S. Forest Service that can discharge 3,000 gallons of water or fire retardant in less than five seconds, covering an area one-quarter of a mile long by 100 feet wide. Retardant is discharged along the leading edge of a fire while water can be dropped directly on the flames. Once the load is discharged, it can be refilled in less than 12 minutes. According to Forest Service records, the agency had worked with the North Carolina Air National Guard on fire suppression missions since the early 1970s. 7/2/2012 – PETERSON AIR FORCE BASE, Colo. (AFNS) — The North Carolina Air National Guard – and indeed the National Guard across all of North Carolina and the country – is grieving today. 6/13/2012 – ARLINGTON, Va. (AFNS) — Citizen-Soldiers and -Airmen from five states are working alongside civilian first responders as they continue to battle wildfires in Colorado and New Mexico. New Mexico Army National Guard members are still battling the Little Bear wildfire near Ruidoso, N.M., which is approximately 35 percent contained, said Guard officials. The number of New Mexico Guard members has increased from 117 to approximately 218 since June 11. The New Mexico Guard has deployed three UH-60 Black Hawk helicopters, two equipped with Bambi buckets and one on standby for medical evacuations. Guard members there are also performing roving walking patrols, setting up traffic control points, and handing out information to residents who could be affected by the wildfire, officials said. In Colorado, Guard members there are also continuing to battle the High Peak wildfire near Fort Collins, said officials. There are approximately 90 Colorado National Guard Soldiers and Airmen providing support and performing missions such as communication support, refueling, and security. Additionally, the Colorado National Guard has deployed UH-60s equipped with Bambi buckets, said officials, who stated the fire has destroyed approximately 46,600 acres. The Kansas National Guard and Nebraska National Guard are also assisting with wildfire suppression in Colorado, each sending one UH-60 equipped with a Bambi bucket and a crew of nine and four Soldiers respectively. Wildfire suppression operations in Wyoming have concluded in Guernsey State Park, said Guard officials there. Currently, two Wyoming Air National Guard members are working in the communications center augmenting civilian first responders. Wyoming is also scheduled to send one UH-60 equipped with a Bambi bucket, and a crew of four, to assist with the Colorado wildfires, officials said. National Guard units are currently battling wildfires in parts of Colorado, New Mexico and Wyoming, deploying approximately 180 Citizen-Soldiers and -Airmen on State Active Duty to assist local civilian first responders. 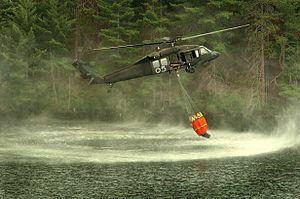 In Colorado, Army National Guard members were assisting firefighting efforts at the High Park fire in Larimer County with two UH-60 Black Hawk helicopters equipped with Bambi buckets and a total of eight personnel on State Active Duty as of 8:00 a.m. June 11, said a report. Colorado Guard members were also providing a fuel truck to support the wildfire mission, and manpower to the Incident Command Team headquartered at the Colorado National Guard’s Fort Collins Readiness Center. Guard members in New Mexico are providing support to what has become the largest wildfire in the history of the state, affecting approximately 263,500 acres near Reserve, N.M. according to officials there. The New Mexico National Guard was providing approximately 117 personnel as of 8:00 a.m., as well as two UH-60s equipped with hoists for medical evacuation support, two M1083 Standard Cargo Trucks, and 11 Humvees with personnel providing roving patrols and establishing checkpoints, said a report. In Wyoming, approximately 46 Guard members were providing wildfire suppression support as of 3:00 p.m. EDT June 11. The Wyoming National Guard is also providing fire trucks, communications equipment and three UH-60s equipped with 660-gallon Bambi buckets on site, said Guard officials there.